It leaves kitties staggering, but it doesnÔÇÖt hurt -- find out why a "CH cat" could be an awesome addition to your family. You’ve probably seen those videos of cats staggering all over the place, doing their best to move around on their splayed legs and trying to orient themselves as their heads bob and weave. Maybe you’ve wondered if they’re suffering, if they’re in pain ÔÇô- and maybe you’ve even wondered if it’s cruel to let these cats live given their disability. Well, fear not. These cats aren’t in pain. They aren’t suffering or feeling angst. They just have a condition called cerebellar hypoplasia, also known as CH, which means the part of the brain that controls physical coordination is underdeveloped. If a pregnant cat is exposed to the virus — or the vaccine — for panleukopenia late in her pregnancy, the developing kittens’ brains can be affected. But not every kitten in a panleukopenia-exposed litter will develop CH. The condition can also be caused by prenatal trauma, including malnutrition. You may be able to see right away that a kitten has CH because she doesn’t seem to be able to get herself into the right position for anything. If you don’t notice it at birth, you’ll certainly notice something is amiss once the kittens start crawling and walking around. Cats with mild CH have few symptoms. They may have a slightly waddling gait, but they’re quite capable of getting around like other cats. 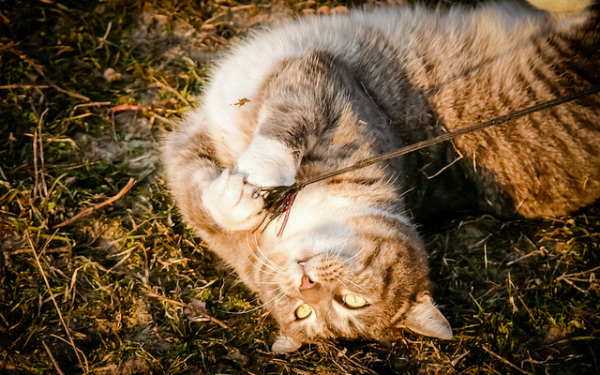 Moderate CH is a bit more challenging for cats because they can’t seem to get their whole body to work together sometimes, and they tend to have a splayed walk. When stressed, they can develop head tremors or have more difficulty getting around. Cats with severe CH need a lot of special care: They typically can’t walk on their own, have almost constant head tremors, and flip and flop to get around. A cat’s cerebellar hypoplasia isn’t going to get worse over time. It’s not going to get better, either, but as a cat learns to adapt to the condition it can appear that she’s improving. Physical therapy and hydrotherapy can help a CH cat to adapt to her disability. There’s no reason to fear bringing a CH cat into your home, because your other cats won’t catch the disease. 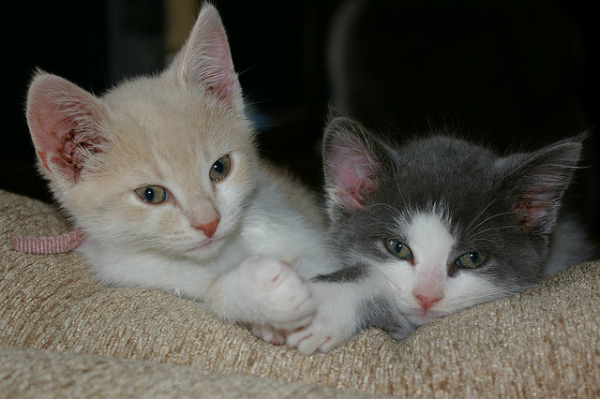 CH is congenital — kittens are born with it — and don’t acquire it later in life. It may take a little while for a non-CH cat to get used to a CH cat’s body language, since CH cats don’t move like ordinary cats, but CH kitties can be integrated into a household just like any other cats. Cerebellar hypoplasia is not a life-shortening condition. Although their lack of coordination can increase their risk of injuries, it does not predispose them to any other illnesses. There’s no reason to be scared of cats with cerebellar hypoplasia. They don’t suffer, they’re not in pain, and they love and purr just as much as ordinary cats. Check out this awesome video of a CH kitty for proof. For more information about CH and to find adoptable CH kitties in your area, visit the Cerebellar Hypoplasia Cats & Kittens website. If you have a cat with severe CH, this video provides instructions on how to build a DIY kitty walker. 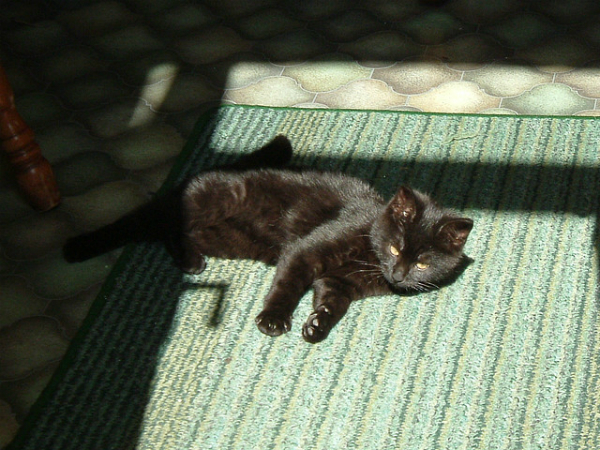 Do you have a cat with cerebellar hypoplasia? What’s it been like for you to care for her? Please share your stories in the comments, and bonus points for photos and videos! Ask a Vet: Why Is My Cat Uncoordinated?